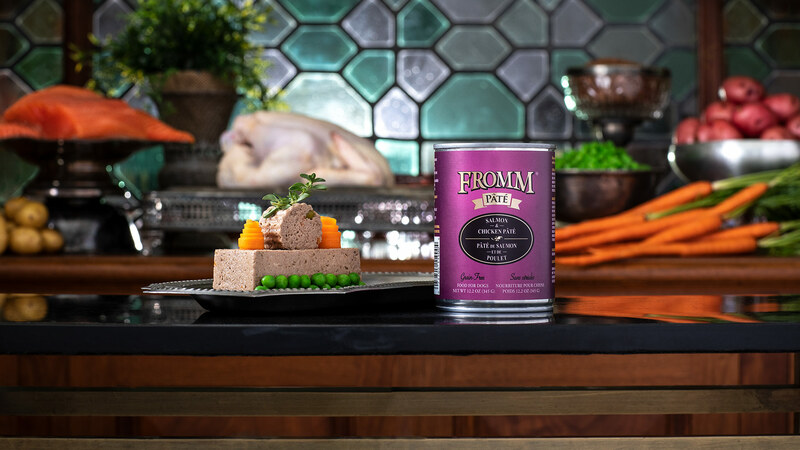 Fromm Salmon & Chicken Pâté features finely minced salmon & chicken cooked in chicken broth with potatoes, carrots, and peas. The recipe is prepared in small batches, ensuring consistency, quality, and superior taste. Salmon & Chicken Pâté is complete and balanced for all life stages. INGREDIENTS: Salmon, chicken, chicken broth, chicken liver, potatoes, carrots, flaxseed, peas, tomato paste, salt, potassium chloride, Minerals [dicalcium phosphate, zinc sulfate, zinc proteinate, calcium carbonate, ferrous sulfate, copper sulfate, calcium iodate, iron proteinate, copper proteinate, manganese sulfate, manganese proteinate, cobalt sulfate, cobalt proteinate], xanthan gum, dried egg product, locust bean gum, Vitamins [Vitamin E supplement, niacin supplement, d-calcium pantothenate, riboflavin supplement, vitamin A acetate, biotin, thiamine mononitrate, Vitamin B12 supplement, pyridoxine hydrochloride, Vitamin D3 supplement, folic acid]. Fromm Family Salmon & Chicken Pâté Food for Dogs is formulated to meet the nutritional levels established by the AAFCO Dog Food Nutrient Profiles for All Life Stages, except for growth of large size dogs (70 lbs. or more as an adult).